There are few things more charming and retro than decorative plates to hang on your wall. But these are not your grandmother’s hanging plates. Only one or two of these plates resemble the cherished plates that once hung on walls in pioneer homes or in dusty cottages of the early frontier settlements. These are artworks intended to be displayed, not used on a table or part of a table setting. Tie your room décor together with a coordinated multi-plate arrangement. A few are available as sets of individual plates, but more are already arranged with a metal framework, ready to hang on your wall. The plates that are not yet arranged, have a coordinated theme and sometimes come with their own hangers so you don’t have to rely on the hardware plate hangers. Metal plates are a bit safer for wall hanging than ceramic plates. They are less likely to be damaged if a hanger gives way and sends them crashing to the floor. More than that, baked enamel is a superb way to add bold colors that do not fade easily to your kitchen or dining room areas. 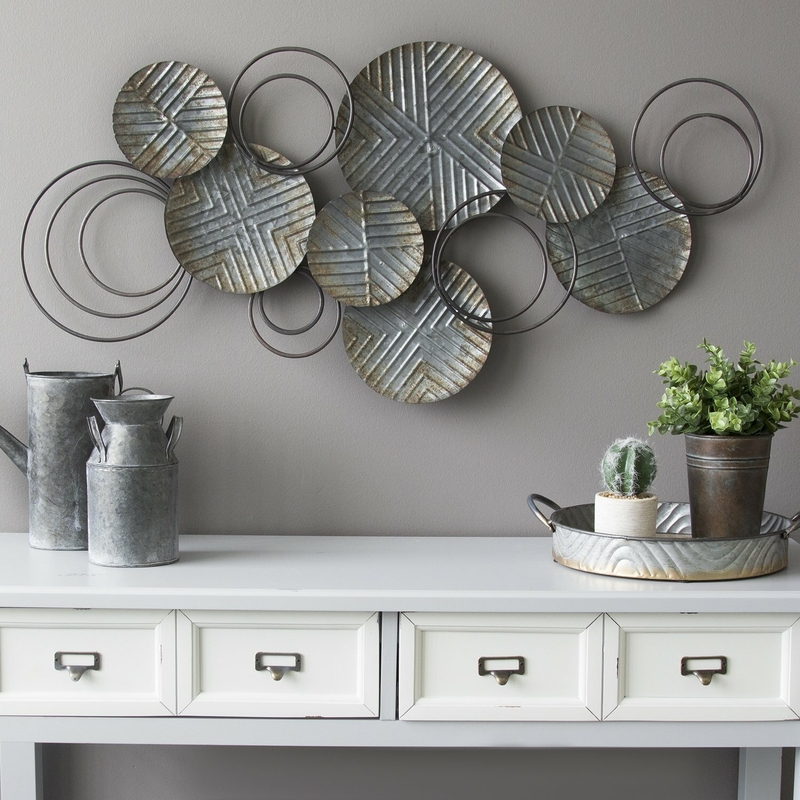 Ranging from artsy arrangements of galvanized tin to art deco unique designs, metal plates make a bold statement on your walls. If you like to collect plates, then you might want to secure ceramic plates. There is no finer way to do it than to use one of the metal frames, similar to the plate sets shown here. By using a framework, you can shift plates from your collection in and out without having to deal with changing wall fixtures. Failing that, individually manufactured clips are sold in many art and craft shops expressly for the purpose of hanging wall plates. Below you will find ten examples of hanging wall plates. The variety and type of plate is almost infinite, so you have an excellent chance of finding the plate or plates that suit your interior decorating theme. You can use the plates to commemorate events or travel, or you can use them to dream a little about other places and other climates. Spice up your cottage or country kitchen theme with this arrangement of galvanized plates and metal scrollwork. The arrangement combines the best of remembering rain on a tin roof with shabby chic elegance. Add metal milk cans, galvanized basins, and similar items for a true walk through yesteryear. Nothing says country like dish tubs and dairy appliances from days gone by. Enjoy the appearance of baked enamel plates, decorated with bright floral designs and displayed against a metal scrollwork frame. This cheerful design will brighten up any kitchen or create an interesting way to greet visitors as they enter the front hallway. You can easily add corresponding vases or floral arrangements in the room. Enjoy the bold, startling colors in this collection of hanging wall plates. Perfect for the entryway, living room, dining room or kitchen, the stylized floral patterns will perk up any blank wall. Certain to go perfectly with bold ceramic vases filled with summer cut flowers or with art deco accents, or to brighten up your home when winter sets in. Reminiscent of Salvador Dali this blown-glass wall plate can easily also be displayed as a tabletop or niche ornament. Its color shades subtly from clear to yellow to a blue-green that puts one in mind of water. Stripes of green, resembling seaweed or water grass, run through it. This delicate plate reminds one of a fragile aquatic ecology. Remember that wonderful day at the beach or dream of going there with this nine-piece wall decoration. Each plate is pierced in two places to admit a thong of leather for hanging. Line drawings in blue depict such things as seashells, snail shells, and starfish. The stark treatment of the drawings makes these plates excellent for a minimalist décor. Enjoy classic designs showing birds or flowers against a vintage brown background surrounded with “lace.” The entire design is rendered on the metal plate. These pieces can add a serene, if somewhat nostalgic, beauty to any room in the house. These can easily be teamed up with Victorian décor or even Edwardian. Shown in strong colors, this hand painted plate displays Francisco Guerreros “Women of the Andes.” Three women are shown in silhouettes wearing the traditional hats and shawls worn by women in that region. Each woman is shown with an olla, a large clay jar, and a basket is displayed at the center of the grouping.